Anglo-Saxon architecture was a period in the history of architecture in England, and parts of Wales, from the mid-5th century until the Norman Conquest of 1066. Anglo-Saxon secular buildings in Britain were generally simple, constructed mainly using timber with thatch for roofing. No universally accepted example survives above ground. There are, however, many remains of Anglo-Saxon church architecture. At least fifty churches are of Anglo-Saxon origin with major Anglo-Saxon architectural features, with many more claiming to be, although in some cases the Anglo-Saxon part is small and much-altered. It is often impossible to reliably distinguish between pre- and post-Conquest 11th century work in buildings where most parts are later additions or alterations. 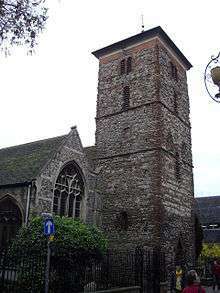 The round-tower church and tower-nave church are distinctive Anglo-Saxon types. 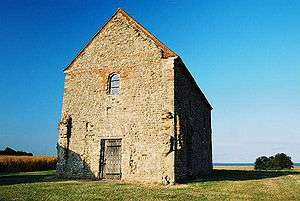 All surviving churches, except one timber church, are built of stone or brick, and in some cases show evidence of re-used Roman work. 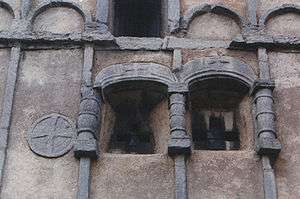 The architectural character of Anglo-Saxon ecclesiastical buildings range from Celtic influenced architecture in the early period; Early Christian basilica influenced architecture; and in the later Anglo-Saxon period, an architecture characterised by pilaster-strips, blank arcading, baluster shafts and triangular headed openings. In the last decades of the Anglo-Saxon kingdom a more general Romanesque style was introduced from the Continent, as in the now built-over additions to Westminster Abbey made from 1050 onwards, already influenced by Norman style. In recent decades architectural historians have become less confident that all undocumented minor "Romanesque" features post-date the Norman Conquest. Although once common, it has been incorrect for several decades to use the plain term "Saxon" for anything Anglo-Saxon that is later than the initial period of settlement in Britain. Early Anglo-Saxon buildings in Britain were generally simple, constructed mainly using timber with thatch for roofing. Generally preferring not to settle within the old Roman cities, the Anglo-Saxons built small towns near their centres of agriculture, at fords in rivers or sited to serve as ports. In each town, a main hall was in the centre, provided with a central hearth. The fall of Roman Britain at the beginning of the fifth century, according to Bede, allowed an influx of invaders from northern Germany including the Angles and Saxons. 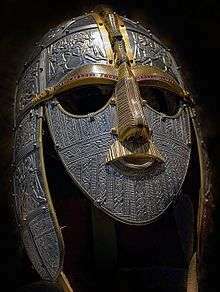 The Angles and the Saxons had their own religion, but Christianity was on its way. St Patrick, a Romano-British man, converted Ireland to Christianity, from where much of Western Scotland was converted and much of Northumbria was reconverted. Links were also established between the Christian communities in Ireland and those in Wales and the Westcountry at sites such as St Pirans Oratory which represents some of the earliest Christian architecture extant on the British mainland. The architecture though was initially influenced by Coptic monasticism. Examples of this can be seen today in the form of rectangular dry-stone corbelled structures such as at Gallarus Oratory, Dingle and Illauntannig, Ireland. Christianity and Irish influence came to England through missionaries. In 635, a centre of Celtic Christianity was established at Lindisfarne, Northumbria, where St Aidan founded a monastery. In 597, the mission of Augustine from Rome came to England to convert the southern Anglo-Saxons, and founded the first cathedral and a Benedictine monastery at Canterbury. These churches consisted of a nave with side chambers. In 664 a synod was held at Whitby, Yorkshire, and leaders of both the Celtic and Roman Church united the church throughout England. Larger churches developed in the form of basilicas, for example at Brixworth. The Romano-British populations of Wales, the Westcountry, and Cumbria experienced a degree of autonomy from Anglo-Saxon influence, represented by distinct linguistic, liturgical and architectural traditions, having much in common with the Irish and Breton cultures across the Celtic Sea, and allying themselves with the Viking invaders. This was however, gradually elided by centuries of English dominance. Characteristically circular buildings as opposed to rectangular, often in stone as well as timber, along with sculptured Celtic crosses, holy wells and the reoccupation of Iron Age and Roman sites from hillforts such as Cadbury Castle, promontory hillforts such as Tintagel, and enclosed settlements called Rounds characterise the western Sub-Roman Period up to the 8th century in southwest England and continue much later in independent Wales at post-Roman cities such as Caerleon and Carmarthen. Subsequent Danish (Viking) invasion marked a period of destruction of many buildings in Anglo-Saxon England, including in 793 the raid on Lindisfarne. Buildings including cathedrals were rebuilt, and the threat of conflict had an inevitable influence on the architecture of the time. During and after the reign of Alfred the Great (871-899), Anglo-Saxon towns (burhs) were fortified. Contemporary defensive banks and ditches can still be seen today as a result of this. 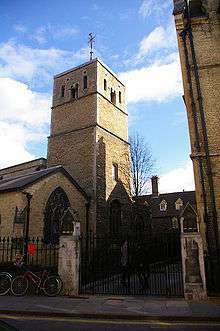 Oxford is an example of one of these fortified towns, where the eleventh century stone tower of St. Michael's church has prominent position beside the former site of the North gate. 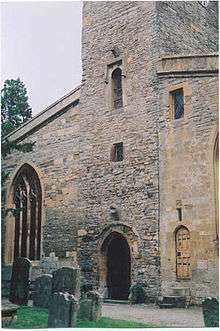 The building of church towers, replacing the basilican narthex or West porch, can be attributed to this late period of Anglo-Saxon architecture. 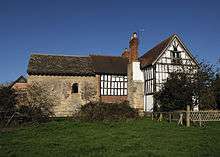 The earliest surviving Anglo-Saxon architecture dates from the 7th century. 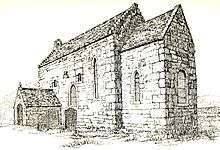 Church designs at the time differed between the North of England, which are narrow with square ended chancels; and the south, which are similar to St Augustine's churches with evidence of having apsidal ends separated from the nave by a triple arch opening, for example at Reculver. Exceptions to this include the Old Minster, Winchester. The most complete example of the northern type of church is at Escomb, but in the south there is no surviving complete 7th-century church with an apse. At Bradwell-on-Sea, only the nave survives. Little is attributable to the 8th and 9th centuries, due to the regular Viking raids. Developments in design and decoration may have been influenced by the Carolingian Renaissance on the continent, where there was a conscious attempt to create a Roman revival in architecture. 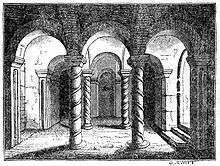 The 11th century saw the first appearance of the High Romanesque style in Britain. The decades before the Conquest were prosperous for the elite, and there was great patronage of church building by figures such as Lady Godiva. 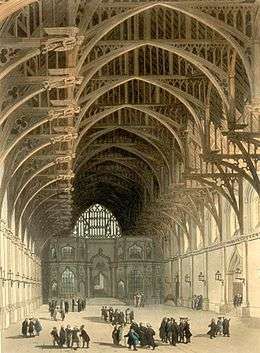 Many cathedrals were constructed, including Westminster Abbey, although all these were subsequently rebuilt after 1066. Norman workers may have been imported for Westminster Abbey through the Norman Archbishop of Canterbury, Robert of Jumièges. It is rare for more than one of these features to be present in the same building. 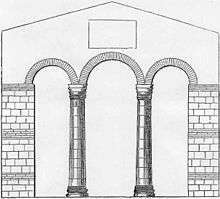 A number of early Anglo-Saxon churches are based on a basilica with north and south porticus (projecting chambers) to give a cruciform plan. However cruciform plans for churches were used in other periods. Similarly, a chancel in the form of a rounded apse is often found in early Anglo-Saxon churches, but can be found in other periods as well. Anglo-Saxon secular buildings were rectangular post built structures, where timber posts were driven into the ground to form the framework of the walls upon which the thatched roofs were constructed. Generally preferring not to settle in the old Roman cities, the Anglo-Saxons built small settlements near their centres of agriculture. In the towns, there is evidence of main halls, and other forms of building of the towns people. Almost no secular work remains above ground, although the Anglian Tower in York has been controversially dated to the seventh century. During the 9th and 10th centuries, fortifications (burhs) were constructed around towns to defend against Viking attacks. Though very little contemporary evidence survives, methods of construction, including examples of later buildings, can be compared with methods on the continent. A number of British grubenhäuser have been excavated, for example at Mucking. In addition to the sunken huts, vernacular buildings from the migration period found at Mucking included more substantial halls up to 50 feet (15 m) long and 25 feet (7.6 m) wide with entrances in the middle of both longer sides. There is a reconstruction of an Anglo-Saxon settlement at West Stow. Contemporary illustrations of both secular and religious buildings are sometimes found in Illuminated manuscripts. Savage, A. (1983) The Anglo-Saxon Chronicles, London. Blockley K. and Bennett P. (1993) Canterbury Cathedral, Canterbury Archaeological Trust Ltd.